A warm, authentic ambiance defines the sophisticated suites at Stanford Park Hotel, where understated elegance welcomes you in like a familiar second home. Spacious and relaxing, our one-bedroom suites have a separate sitting room with a sofa, coffee table, flat panel television and a large desk. The ample bedroom includes a reading alcove, king bed with premium cotton linens and LCD TV. The bathroom comes equipped with a double granite vanity. These luxury hotel suites are well-suited to global thinkers and doers who are travelling on business and desire a separate workspace for meetings. 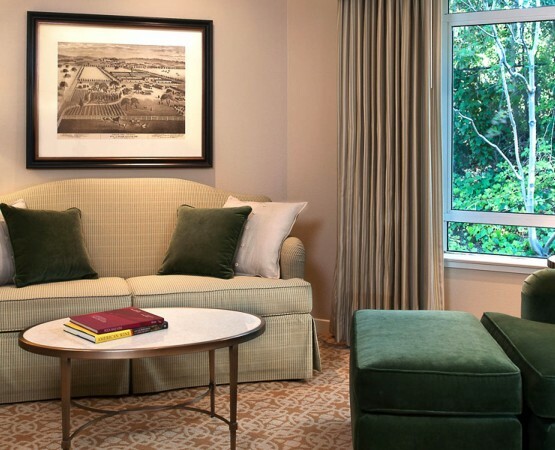 For our most discerning global guests, the Stanford Suite features a large seating area, chandelier-lit dining table, elegant furnishings, original art, a state-of-the-art sound system and flat panel TV, and a canopied king size bed. This Silicon Valley sanctuary also includes a marble walk-in shower and oversized whirlpool bath.